Conventional archiving methods are expensive. Added to this, generation changes render investments erratic and difficult to plan. You do not need to maintain your own archiving system together with all the associated costs and risks. Because with FUJIFILM Archive Services you also have full control of "costs & investments". Instead of rising investment costs due to software or hardware updates and never-ending costs of staff allocation, FUJIFILM Archive Services offers a constant cost line. This means that you can plan your IT budget even well into the future with confidence. Optimisation of your archive by the FUJIFILM data specialists may represent a further opportunity to save. By switching to FUJIFILM Archive Services, your company can lower costs substantially and save well into the future. 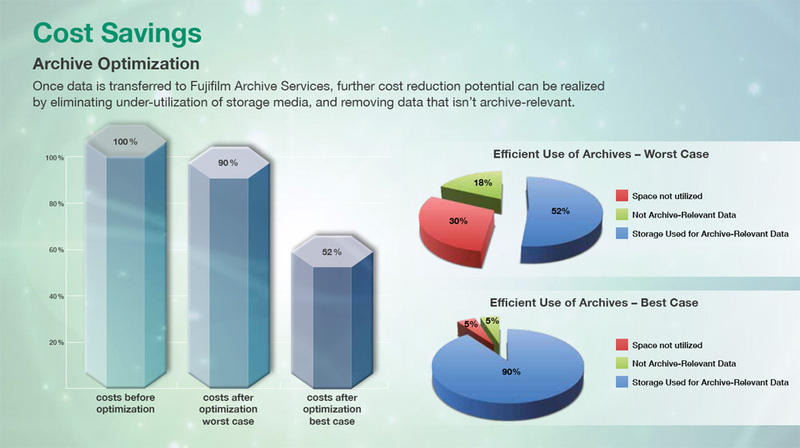 FUJIFILM Archive Services – cut costs, reduce investments, reduce budget items and make long-term budgeting predictable.